I’ve been contacted by large numbers of local residents who are worried, havng discovered that H&F Council has applied to run a wide variety of entertainment events for up to five thousand people in Furnival Gardens. 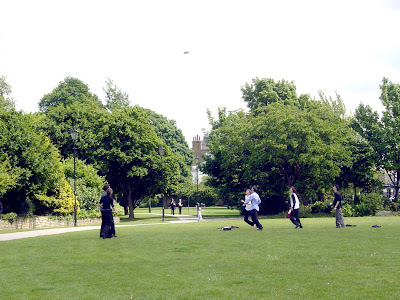 The park runs adjacent to the riverbank in Hammersmith and is surrounded by residential homes. H&F Council put the application in just before Christmas with residents complaining that there has been little notice to get their objections in. This proposal is being pushed through by the ever-ambitious Councillor Paul Bristow (Con) who was recently behind similar schemes for Ravenscourt and Bishops Parks. The embattled Cllr. Bristow was forced into a series of humiliating u-turns having found his judgement and competence questioned by councillors of both political parties after he had signed off plans to allow Ravenscourt Park to run entertainment events that included boxing, wrestling and those of an adult/sexual nature. H&F Council put their application in on the 11th December and asked for all objections to be in by 8th January. However, the Licensing Committee can agree to accept late objections and can also vote to allow residents that write in late, to address their concerns to the Licensing Committee meeting on 28th January. You can view the licensing papers here and read H&F Council’s licence application here. To email your comments to the licensing section please click here and quote 2007/05731/LAPR. If you want me to make representations on your behalf then please say so and send me a copy of your email to the Licensing Section by clicking here.